The next step in your seed starting journey is coming up with a medium in which to plant them. Seeds will germinate on a wet paper towel just fine, but they won’t make it a whole lot further without a good seed starting mix. You can certainly just go out and bring in a bucketful of your regular soil, but in all likelihood, that’s gonna be a little on the heavy, dense side. I’m not suggesting that it won’t work; if you want to give it a shot, go ahead, and you’ll probably get some kind of results. But ideally, your delicate little seeds would prefer something on the lighter side, something that holds water and warmth, but also drains very well – one of the biggest causes of dead seedlings is too much wet, not enough dry. 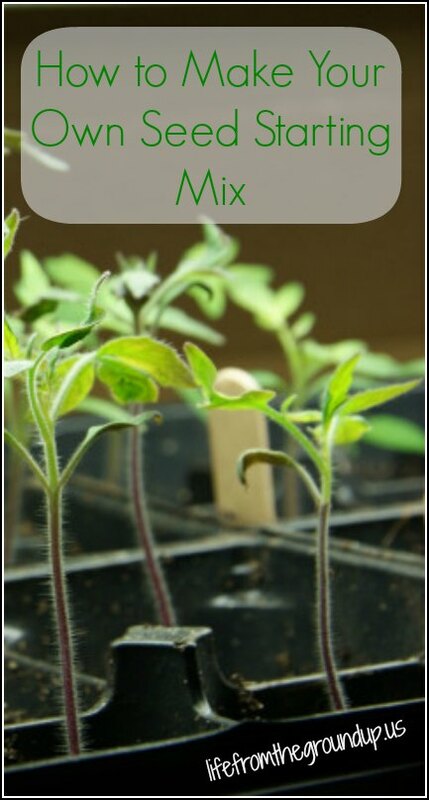 So to reach that ideal combination, I’m going to show you how I make my own seed starting mix. Sure, you can buy those little bags from your local nursery, but they don’t stretch very far (really, you’d be surprised at how quickly a 2 quart bag is gone), and they’re a lot more expensive. And I like cheap. What’s in a Seed Starting Mix? Really, it depends, and there’s no one formula that you need to follow. Just remember, you want it light and fluffy, but also absorbent with some heat-retention capability. Not too much to ask, is it? My personal mix consists of peat moss, vermiculite, and a bit of compost, worm castings, or some well-rotted manure (basically, just a little good organic matter). The peat moss holds water well (though, ironically, it’s hard to get it to hold water when it’s bone dry), vermiculite (those little gold flecks you see in potting mixes) keeps the soil loose, and the compost provides a little extra boost of nutrients. 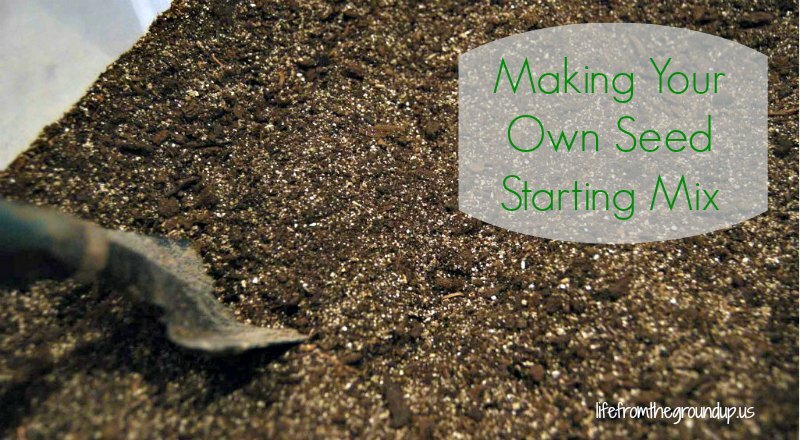 You can also mix in a little starter fertilizer, something that will add beneficial microbes to the soil. Assuming you buy this stuff in bulk (check your local garden center; big box stores may or may not have what you need), you’ll need a container to mix it in. I use a regular Rubbermaid-type storage bin, maybe 8 or 10 gallon size? A good ratio is 2 parts peat moss, 2 parts vermiculite, and 1 part compost, so start by measuring about 24 cups of peat moss… You’re crazy if you actually measure it out – just eyeball it. Your plants won’t like you any less if it’s 42% peat moss. Toss it all into your container. If it has a lid, pop it on and shake it up, or just mix by hand using a trowel. And now you have a seed starting mix. Where Do I Plant My Seeds? Okay, you’ve got the mix, now where do you put it? Do a search and you’ll find all kinds of DIY seed starting containers – egg cartons are popular, yogurt containers, plastic cups, and even newspaper. You can also buy peat pots and small flats specifically for seedlings – I tend to use leftover flats from flowers we’ve bought in years past. You’re only limited by your imagination! But whatever you do, make sure your containers have some kinds of drainage (use a nail to prick a few holes in egg cartons, for example). Planting seeds in something that’s watertight is a surefire way to drown them as soon as they sprout! My mix is 1 part peat moss and 1 part composted manure, mixed in a bucket. I add a handful of lime to balance the acidity of the peat, which I’m not sure is entirely necessary, but I’ve always done it. When I fill my six-packs – you know how after they are watered, the soil level goes down? 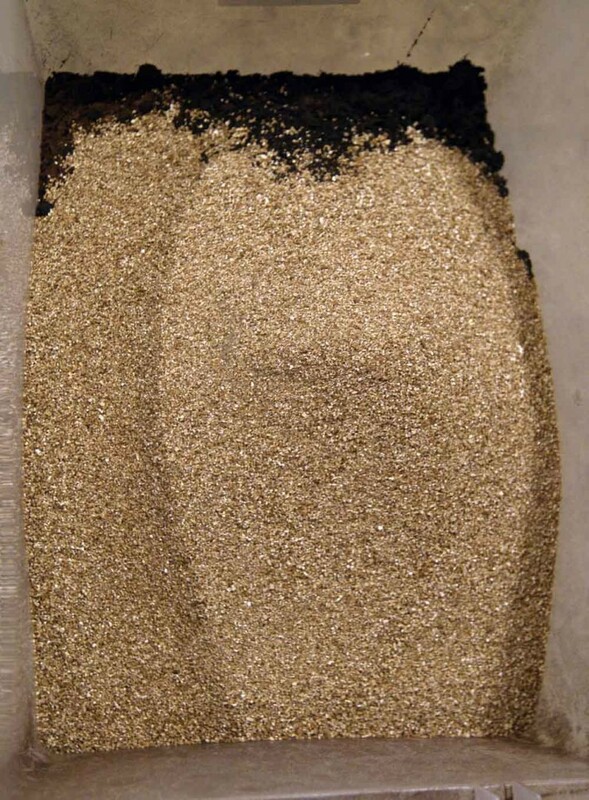 I fill that with vermiculite, so it winds up with 1/4 – 1/2 inch of vermiculite just on top. I plant in the vermiculite layer. That’s ideal for the seeds, which stay wet in complete fluff until they sprout. Then they root into the manure/peat – which is so fertile I don’t have to do anything until they’re in the ground. I mean, big stuff like tomatoes has to be transplanted, of course. But most of my seedlings, currently 11 trays of 4 onions, 3 cabbages and a broccoli as I write this, need nothing but water until transplanted. There’s no plucking out and transplanting tiny plants from flats cause I have both the seed starting and growing bits in layers in the six pack – they just grow happily until they go into the ground. Obviously, the same system would work without six-packs, just after years of doing this, I’ve decided the square six-packs that fit 12 packs to a tray is the easiest thing to do.